Here is Hailey a few years ago saving the world from a wave at the big beach at my parents. She will get to enjoy it again at the end of July. First, if you haven't done so, visit our Thursday post HERE and leave a comment to win a $25 gift card from Amazon! When I read stories of people who have 25 dogs in an apartment or 47 cats, my first thought is "that is crazy." However, when I think about it, I realize I shouldn't judge, because that could be me. I love my dogs so, so much. My whole life revolves around them. Every time I see a dog who doesn't have a loving home, I want to bring it home. Several weeks ago I was minding my own business at the local tiny hardware store, when I heard someone say "puppy for sale". Next thing I knew I was holding an 8 week old retriever. She was so soft, and she was licking my face with her terrible puppy breath. It was great! When we were done it took all my willpower to put that puppy down and walk out of the store. I even named her. That same weekend, I was in town and I stopped by PetSmart to get dog food. They had just put the last dog from the adoption event back in the truck to return to the shelter. If I had been earlier I would have been faced with having to walk by homeless rescued dogs. That would have been tough. Almost every day I ask the Man for another dog. Every day he says no. Uf he didn't say no would have 3. Then likely 4 and then 5 . . . . . . .then I would be a dog hoarder. There are things I do to try and help decrease my desire to overfill my house with dogs. I have unfollowed most dog rescues on Twitter, (although I feel guilty about that, but less guilty then the daily reminder that all those pups need homes. 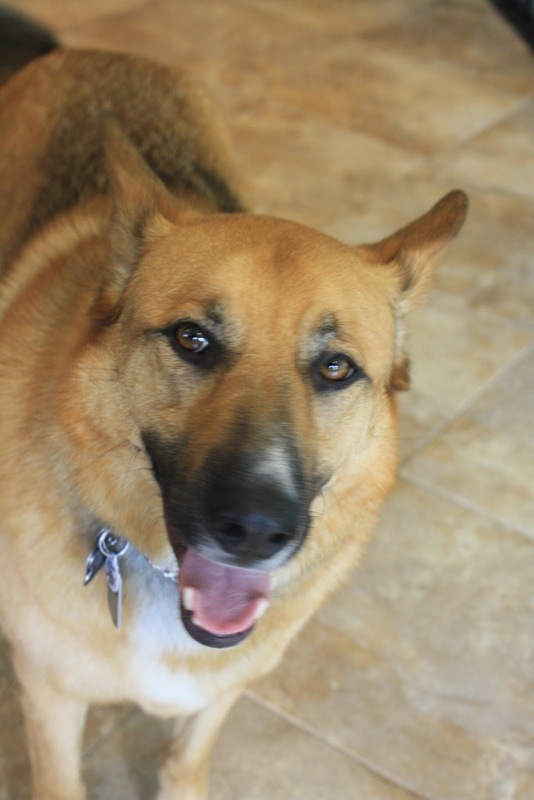 I avoid blog posts about dogs looking for homes. I do not allow myself to visit the rescue or SPCA type sights. Every time I do, I desperately find a pup I want to bring home. I have thought about volunteering with a rescue organization but fear the temptation to help will be too great. Thanks to Murphy and Stanley for hosting this fun event. Here is Nin's story. It was really, really embarrassing! "The harder I tried to get it off me . . . the longer the stupid photo shoot took." So I just sucked it up and hoped it was over soon. Disclaimer: This is a sponsored post. However, the opinions expressed are my own. When the opportunity to write about Dog Fence DIY came up, I paused. As regular readers know, we have had some discussions on this type of fence on the blog before and I haven't been sure it was the right fit for my pack. Instead of saying "yes" to this, I emailed the company with a bunch of questions. It seemed like a great opportunity to at least learn more. They were fantastic at answering my questions and setting up a time to talk to me via phone to answer even more! This is a summary of what I learned. -This type of fence is best for people who have more than 1 acre and is used a lot with farmers. 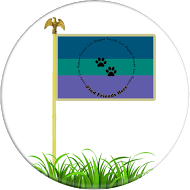 -It can be used not only to keep a dog in the yard, but to keep a dog out of an area (such as a chicken coop or industrial kitchen). -You can get a unit with a training zone, which provides a warning vibration about 3 feet before a correction zone, which provides the shock. -The strength of shock can be adjusted to be appropriate for each individual dog. -The company is working on technology that would stop the correction (aka shock) if a dog left the yard but was coming back. This has not been perfected yet. Make sure that you have the right collar. They have several different collars, and dogs who may be shaved sometimes may need 2 different collars depending on their fur length. Training - You can't just pop an invisible fence up and think your dog will stay. They need several weeks of training to teach them. -The DIY fence are not for everyone or every dog. The representative I spoke to suggested that this was the correct solution for only 2/10 dogs. After my conversation with the company and looking over the materials, I am still on the fence if this is the right solution for Hailey. However, I feel far more informed and know where to get more information, and therefore am happy to pass it on. If you have any questions, please leave them in the comment section below. The company will be happy to come back and answer them. Now for the fun part, the give way. The winner will need to supply an email address that I can share with the company. To enter to win, just leave a comment below before . We will randomly select a winner, using the app Roundom, from all the comments received by 3 pm EST Sunday May 31. 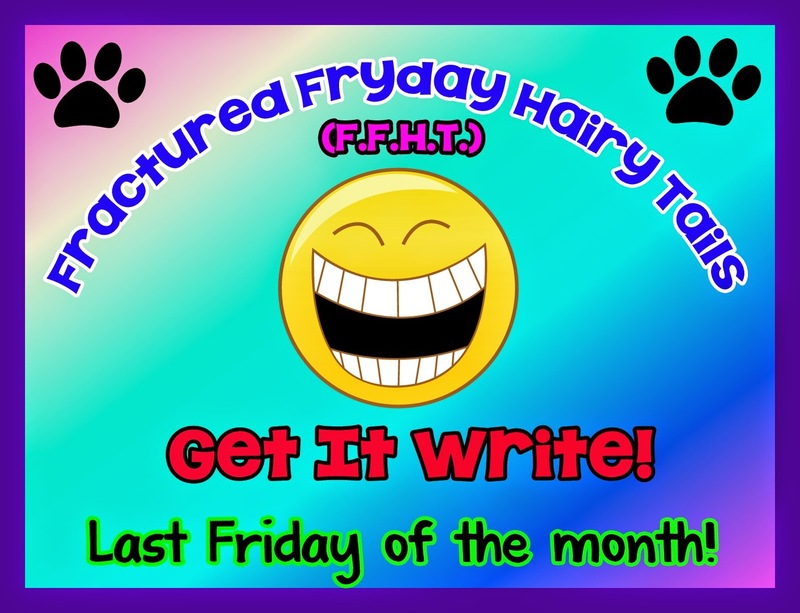 Wordy Wednesday - Lady is back! Lady had a great time in San Antonio. She says she is sending her best wishes to the folks in Texas affected by all the terrible storms. San Antonio only had a few little storms (Lady loves storms so was a little disappointed). Lady thought the storm warning system that pops up on your phone was really cool. While Lady was away having Margaritas for breakfast, Man did a pretty good job at taking care of us. We tried to tell Lady we were hard done by, but she didn't buy it. Man even took us to the beach one day! We did have a visitor one morning. Lady and Man are not happy he is around. We think he would make a cool friend! We were both over the moon to have our Lady back. Hailey spent the evening on her legs and Phod did the unusual and curled up in bed with her for a long time (even though it is pretty hot here). Memorial Day weekend approaches. This is a big deal in our house because it is the weekend of Lady's professional conference in the U.S. of A. This year, she is off to San Antonio, Texas. This means for the next 5 days the Man is in charge. We will fill you all in on our many adventures when she is back and will try to do a little visiting if she has a moment between conference, sight seeing, the bar, the big floods they are calling for there . . . . . Happy Memorial Day to Our American Pals! We were excited to learn that Zuke's is hosting the #FuelTheCure campaign. 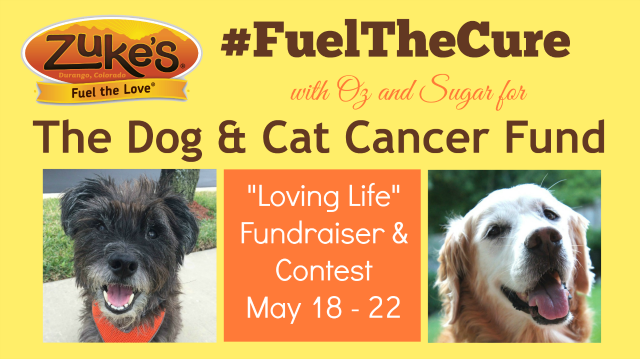 For every blog that posts, Zuke's is donating $5 to the Dog and Cat Cancer Fund. Here we are in action, loving life! We love Zuke's and we love life! Disclaimer: This is a sponsored post with Mums the Word Network and Nutrience. All opinions are my own. 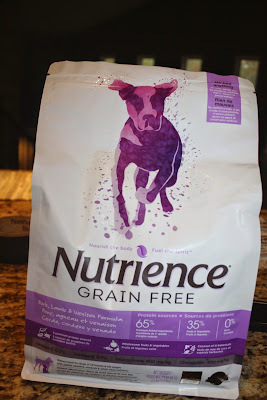 I was super excited to be asked to do a review for Nutrience Grain Free Food. As regular readers know, Zaphod can be very picky, so trying new foods with him can be risky. He is the one I use to judge foods and treats as Hailey will eat pretty much anything. As a person who found out 3 years ago she couldn't eat gluten, I am always interested in grain free options for my pups. I want to limit the amount of grains in their diet. This made me even more excited about testing this food. "Featuring 3 premium and varied novel protein sources, such as pork, lamb and venison, along with regional fruits & vegetables, nutrient-rich botanicals, healthy fats and nutritional supplements. " 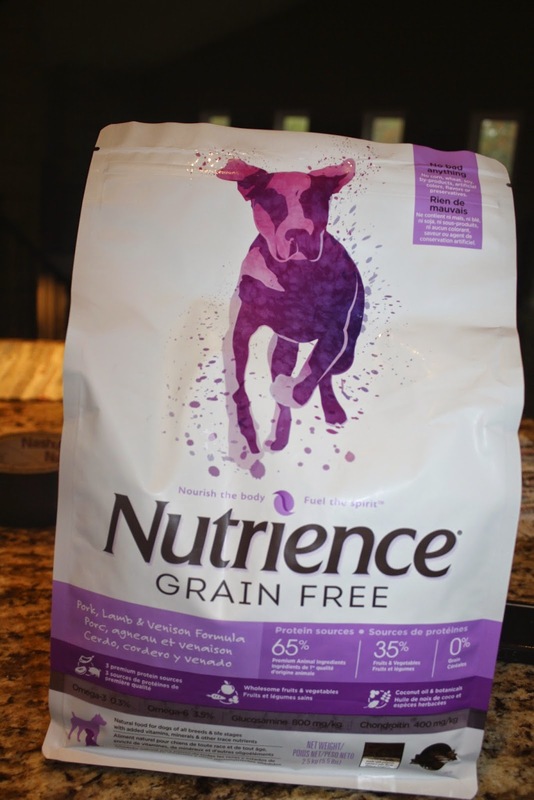 To find out more about this specific food please go to: http://www.nutrience.ca/dog-food/nutrience-grain-free/dry-food/pork-lamb-venison-formula/ . I opened the bag, put it in their dishes and held my breath. Would the meat in the product outweigh the fruits and vegetables that Zaphod traditionally hates? What happened next was amazing. 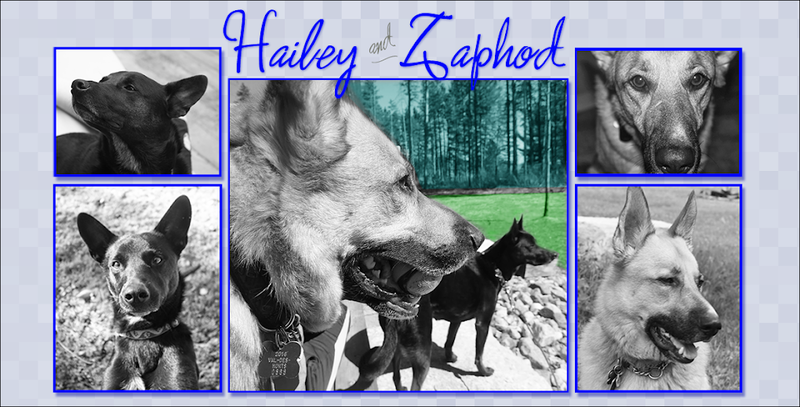 After polishing off ever last bite of his own food, Zaphod went over and started eating Hailey's with her. The Man and I were in shock. We were also shocked that Hailey, who was distracted eating, didn't freak out at him for this! Since then at meal times when in the past Zaphod has waited across the room to be called over, he has now waits more impatiently to be fed. We have a food that Mr. Picky Zaphod loves. How does Miss Hailey feel? She seems to love it too! I was actually due to pick up food this week and after the taste test of this, bought my pups a big bag! We give Nutrience Grain Free Pork, Lamb and Venison 8 paws up! First, to all our Canadian friends, Happy Victoria Day! We have been spending as much time as possible outside (when Lady has been home, she went into the city for a sleepover this weekend), even though the bugs are back. It has been lovely. Strangely, there have been hardly any fireworks . . . . We will just enjoy that. 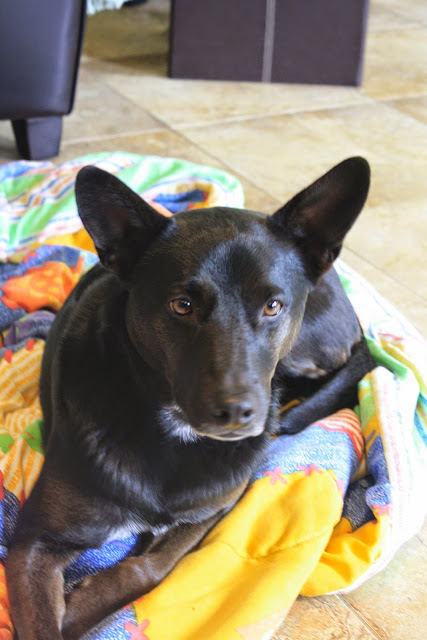 As discussed previously on this blog, sometimes, someone has been peeing on the dog beds, that are impossible to wash. We took all your ideas and decided to go to the thrift shop to purchase some comforters for the pups. Easy to wash, easy to travel with, we don't care if they get ripped apart. The pups seem to have loved these new blankets. Particularly the one we currently have upstairs. However, someone, haven't decided if it is dog or cat, has peed on them and has started peeing on the bathmats. We have been letting Hailey have access to the whole house at night so that Nin can sleep with us. We suspect some of it may be happening then. Our solution has been to pick up the bathmats and to hope this is a phase that ends. Before Christmas, I was asked if I would be interesting in learning about essential oils and reviewing the doTerra trio pack ( http://www.mydoterra.com/myhealthempowered/#/ ). As I have dappled in the world of "traditional" remedies I thought sure, one can always learn more! One of the things I shared with my consultant Heather, was I was interested in another way to treat Hailey's anxiety. Of course, that was in the winter, when Hailey was calm. There was really no need to test them on her, so I did most of the testing on myself! My trio package contained lavender, lemon and peppermint. I live in my tub in the winter, but due to concerns about chemicals have given up bubble bath. I LOVED my lavender baths before bed! They were soooooooo relaxing and smelt so nice! As my naturopath had recommended, and I wasn't doing, I added the lemon to hot water to drink. It aids in digestion. When I do this regularly, I have noticed a difference. Peppermint is the one I used in the most medical way. I had a series of migraines over the winter and found that rubbing the peppermint on my forehead really did help. It took that edge off that drugs alone did not. I also found that rubbing it on my cramps was helpful. My only piece of advice is to make sure you really wash your hands after you have touched a spot with the peppermint. Peppermint in the eye burns! My husband found using peppermint (when he didn't use too much) really helped with his sore muscles after a workout. Since anxiety season has come again for Hailey, I tried the oils on her. First, she was not thrilled with having the drops put on her. Second, we did not notice a difference in her anxiety after the application. It could be she needs more exposure. It could be we didn't put enough. There are many reasons this may not have worked for her. However, I am happy to report that unlike when we tried medication for it, there were no undesired side effects. I enjoyed trying my doTerra oils. I didn't have any allergic reactions or rashes or anything, something as a life long allergy sufferer I was concerned about. I found the peppermint to be helpful for pain. I found my consultant to be knowledgable and willing to put up with my millions of questions. It is definitely something I would still like to learn more about. If you are interested in learning more go to http://www.mydoterra.com/myhealthempowered/#/. Heather also hosts webinars. To find out about them, visit her page http://www.myhealthempowered.com/registration-page. You could win a free trial kit there too! Disclaimer: I was provided with a sample of this product for an honest review. I was really excited when we won the Torus bowl from http://www.ownedbyahusky.ca. It arrived and I put it down and Phod ran right to eat and drank. Hailey was scared (after a few days she was fine) and Nin, well he didn't notice. A day or so later, Nin had his first "episode" and we had made the decision to leave both water bowls down. We didn't want to confuse him if he was already having problems. One morning the old water bowl was out of water, and Nin went over and drank happily out of the Torus bowl. 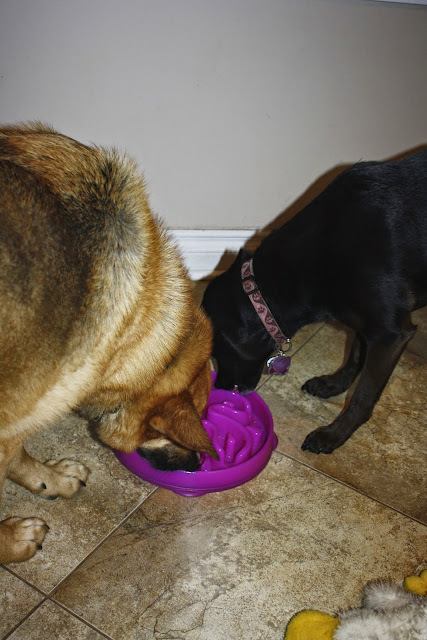 So we have been a one water bowl family every since! It shows that even our old boy can learn something new! Nin has had a seemingly good week. We haven't witnessed any more neurological events (although this doesn't mean they aren't happening). He seems himself, so we are just enjoying him! Thanks again for all your POTP. The scene: Monday evening, approximately 7:30 pm. Front yard of our house in paradise. The Man - standing on the front deck so he wouldn't get rained on. This gives him a higher vantage which is important. Hailey - On her tie out, near the front deck, not enjoying the rain. The Lady throws the ball, aka Precious, for the Phod. Phod picks up Precious and stops to pee. The Man yells "There is a deer right there." Lady yells back "I can't see it from here." Phod drops his ball and goes after the deer. Lady sees nothing but then sees the deer come back a bit and disappear into the bush. Phod comes back, finds Precious, and everyone goes in. Phod ran after the deer. The deer ran toward the fence into the horse field. The deer for whatever reason doesn't jump. Phod jumps up on the deer in a play way. The deer may or may not have kicked him, the deer was kicking, but Phod didn't yelp and showed no injury after. On our walk the next morning we saw where this happened. If you look closely (left of the centre post at the top) at the fence you can see the deer hair on it. This spot on the fence is near this branch, which may have been why the deer didn't jump. Also the horses could have been there (we didn't check that). There is a lot of hair. This could be because of Phod touching it or a fear response. There was no sign of blood or anything. We are assuming the deer was scared and not hurt. The dogs really want to eat all that hair . . . which by the way kind of constipates Hailey. I think the most upset about all of this was Hailey. She wanted to get the deer. Now if we could get one of them to get the mouse! Today we are taking the time to remember a lot of love. First, we were devastated to hear that Goose was called to the bridge yesterday. We send our love to his mom, Michelle. Second, we remember our Loki. It was 5 years ago today he died. 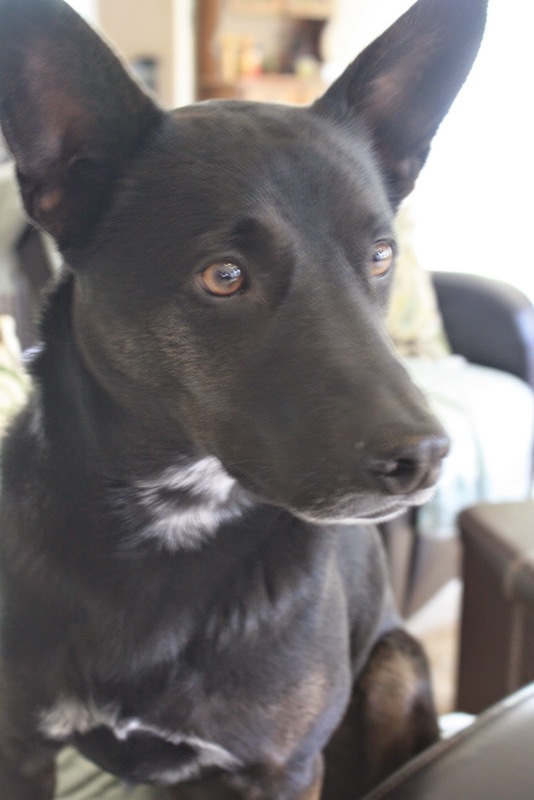 He was such a great pup, and really is the one who turned me into the crazy dog lady I am. I can't believe it has been 5 years. It seems both so long ago and so recently. Loki, the winter before he died. He was so happy, even in illness. Thirdly, today would have been Gemini's 10th adoption day. Her loss continues to be the wound that won't heal in my heart. I hope I live long enough to find peace with her death. 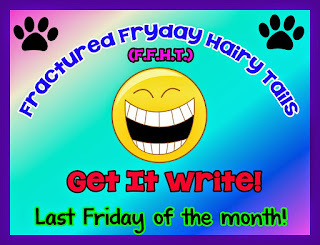 Hailey: "Lady, you are getting an F. First you didn't let me catch up with all my pals over the weekend and now I see it is the end of the day and you are just getting around to posting. F, F, F."
Lady: "Hailey, I am very sorry. I had to work Saturday and then I came down with the flu. It knocked me off my feet yesterday. I hope the worst of it is behind me. Blogville is a loving place, they will understand." Hailey: " Blogville shouldn't have to understand. Are the above also your excuse for not walking me forever and ever?" Lady: "The Man took you out Saturday. You are right I didn't walk you yesterday because I didn't feel up to it. I still wasn't 100% this morning but I took you for a very long walk in the pouring rain." Hailey: "That is another problem, what is with all this rain? Make it stop. I don't like it. Or if you aren't going to make it stop, at least let me roll on your bed to dry off that helps out." Lady: "No to rolling on the bed. However, I will make you a deal. If you can catch the mouse that is in the house and has eaten the hose to the dishwasher and is smart enough to know how to eat the food off the trap, I will let you roll on my bed next time you are wet. Ok?" Hailey: "I will see what I can do." We also send birthday wishes to our Aunt C! Happy Mother's Day to all the Mom's in Canada and the US! After endless seeming months of short, cold days, and long dark evenings, we are seeing beautiful in the spring evening sky! The ice left the lake just about 2 weeks ago. 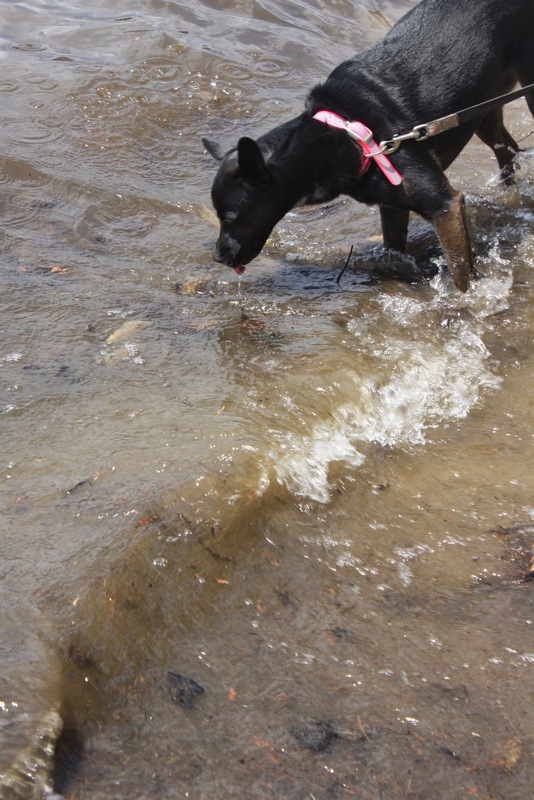 We decided on the weekend, since it was so nice out (22C/71F) we would head on down to the lake to let Phod swim. The pair were over the moon excited when they realized where we were going. We had a few wildlife encounters at the beach. 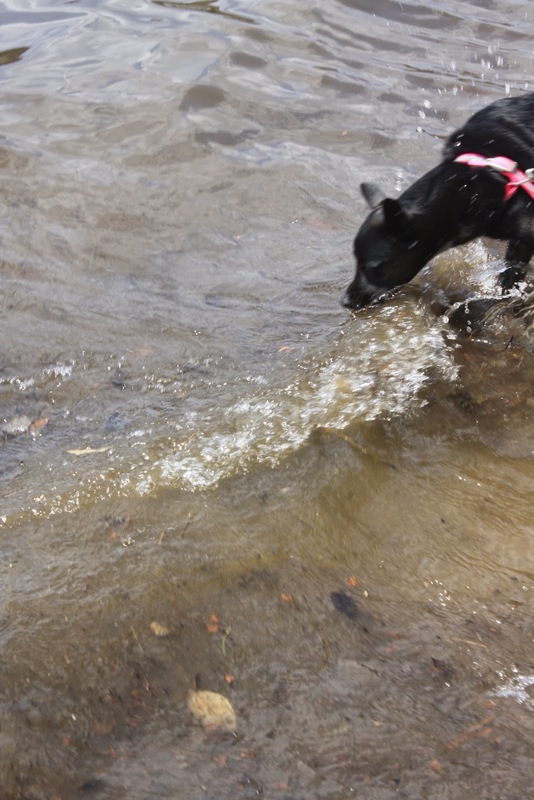 Phod did try and chase the geese who were swimming by, but came back easily. He also chased a frog. Hailey was very mad that she didn't get to chase the frog. Phod bringing back his bumper. Waiting to throw. I hesitate because I know what is coming. Now he looks half puffy and half not! We could use a little POTP in our house. Ancient Cat Nin's death is approaching. This week has not been a good one. He has starting having "spells" that knock him over and leave him temporarily unable to walk. Please send good vibes that he goes peacefully. 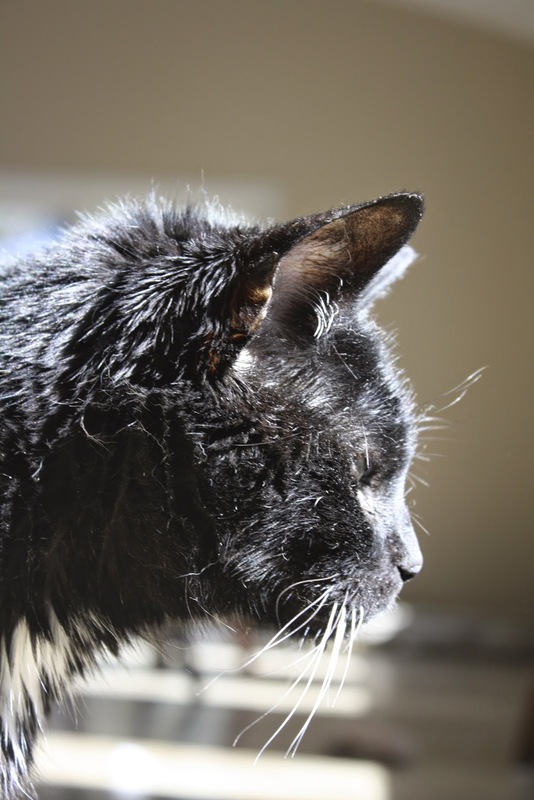 He has lived a great life (he is almost 20 after all). We are assessing the situation very closely and are preparing for our final goodbyes. 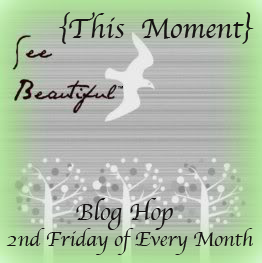 Wordless Wednesday - The Blur! Spring has officially sprung. The wildlife is back. The snow is gone. The grass has turned green. The cottagers (aka city-iots - city idiots) are back. 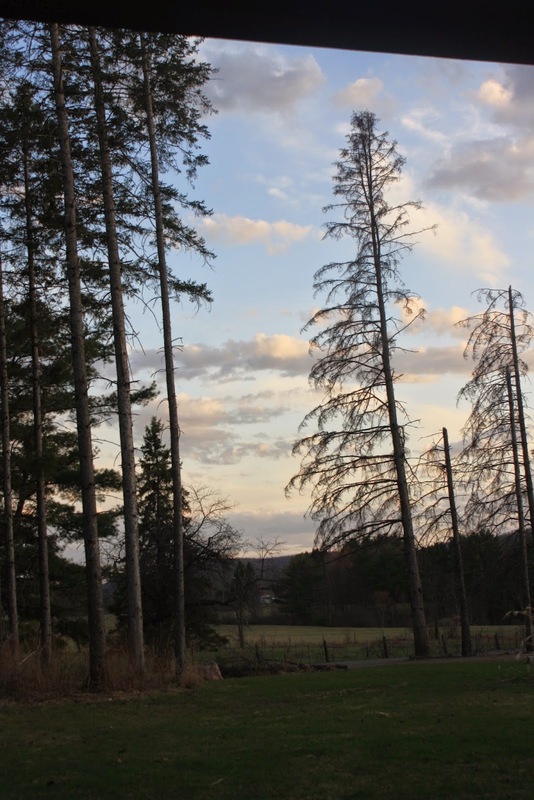 In our municipality there are about 11 000 permanent residents and 10 000 cottagers. I am not sure how, but Hailey remembers that the good weather and the city-iots means that fireworks are back. Saturday night we were sitting outside enjoying the beautiful evening and she was clearly nervous. She didn't want to be outside. She didn't want to leave the deck. She stood at high alert, while Phod pupped around happy and playing. I know it is a time of day thing because earlier in the day Hailey was very happy to be out on her tie out while I did yard work and later, before dinner . She was happy to be out sniffing and digging and rolling. As the evening progressed, she got more anxious. I applied some essential oils from doTERRA for the first time (I will have blog post about this product in a few weeks). She spent the evening hiding. She was very tense when Man took her out before bed and would not pee. She hid in our closet. She was right to be nervous because shortly after 10 the fireworks started. She went to the basement to hide. I guess the one advantage of the winter is Hailey is not as anxious. Mischief 2: Handsome Phod is giving his frisbee a makeover. It doesn't fly as well. I think that he better hope Santa brings him a new one for Christmas as there is no ball play when the snow arrives as balls get lost too easily! The results of his handiwork. Black and White Sunday - Photobomb! Nin was not impressed when Phod photobombed his shot! No pictures again - sorry! The pups and I set out of our morning walk at about 6:50 today. (This was after begging Hailey to let me sleep another hour). The start of the walk was a little uneventful. About a km from our house there is a huge open field with some brush etc. As we were walking I spotted something. My brain at first said, there is someone's dog. Then my brain woke up and said "That is a coyote!" We have lived in our house for 2 years and 10 months today and I have never seen a coyote. Of course I wanted a better look so we walked another 15 or 20 feet. During this time the coyote was 40-50 feet away in the field. She was very aware we were there. She would stop, look at me and then trot a few feet. Finally she trotted into a clearing. We stood and looked at each other for maybe 10 seconds. Then she turned and trotted into the bush. Up to this point for whatever reasons, my pups were completely oblivious to this encounter. They were sniffing away. They even looked around to try and figure out what I was looking for but they never saw here. Because the coyote was heading the way we were heading, and to this point our encounter had been wonderful (far less scary than the porcupine earlier in the week), I cut our walk a little short and headed home. What a cool week for wildlife!